Digital radio is a great addition for any car or van. There are essentially three ways to get DAB digital radio in a car: with an add-on device, replacing the car radio or buying a car which has DAB fitted as standard. Replacing a factory-fit radio with one which can receive DAB is sometimes the neatest solution, if slightly more costly than an add-on device. Many car audio installers and specialists will be able to advise on the best options for your car and the costs. The easiest way to get a quote is to drive to one of these shops, but if you’ve changed a stereo before you may want to install yourself. In the 1980s manufacturers settled on a standardised size for car stereos. These eventually became known as single DIN and double DIN. During the 80s and 90s most cars came with a basic stereo with a radio and cassette or CD player. Many car owners swapped these simple units with more powerful models which provided better sound or extra features. In the 2000s some manufacturers started designing dashboards and consoles without an obviously defined DIN slot. Although some car radios have a sculpted shape to fit into the dashboard many do still use the standard DIN sizes and a fascia can be used to fill in the gap which would be left. The floating console introduced by Volvo in the last decade makes it impossible to easily replace the radio due to the non-standard size. Other cars which blur the boundaries between in-car entertainment and controls for heating, hazard lights and other features make replacement more difficult and costly. Replacement can be carried out by motor accessory shops, some main dealers and specialist car audio firms. In cars with simpler dashboards and trims it’s possible for competent persons to do the work themselves. In addition to the new radio you may need the fascia to fill in any gaps, and in some cases an adapter cable. Some online retailers offer the fascia and adapter cable as a kit, but with some cars the cable included with the new radio is sufficient. If you choose to have your radio installed by a professional these should be included in the work. Can the stereo in my car be replaced? The first step before purchasing an in-dash digital radio is to check whether your car has a suitable single or double DIN slot and if a fascia and adapter are required. In some cars this might be quite obvious. If the existing radio is the ‘DIN shape’ as pictured and is made by an audio brand like Grundig, Blaupunkt, Pioneer, Kenwood, Sony or Philips it’s likely that it can be replaced. If the unit appears to be roughly the correct size and appears separate from the dashboard with a continuous gap between the radio and the rest of the dashboard it probably can be removed. However, you will almost certainly need to purchase a fascia kit to fill the gap left between the dashboard and the new radio. If the gap is a double DIN size you may still be able to select a single DIN radio with a fascia which incorporates a small tray space. Finally, if the radio appears completely integrated within the dashboard, often with a separate screen higher on the console or dashboard, it’s unlikely that the unit can be replaced. You will still be able to look at an add-on device to add DAB digital radio to your car. 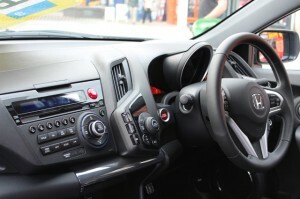 Car audio installers will be able to advise on the available options for your vehicle. The aerial fitted to most cars and vans is only designed for FM, medium wave and long wave reception. Digital in-dash car radios have two separate aerial connections: one for DAB and one for analogue signals. Most replacement digital car stereos come with a stick-on aerial in the box which has adhesive to stick to the inside of the windscreen. The cable can then be hidden behind the dashboard and plugged into the back of the radio. These aerials work in strong signal areas, but do not perform as well as an aerial on the roof of the car. Fortunately roof mounted aerials are not very expensive and are typically available with a magnetic mount or as a complete replacement for the existing aerial. Replacement of the existing aerial inevitably involves ‘dropping’ the headlining in the car and this can be a difficult job. Main dealers often have the correct workshop tools for this work and some will provide a quote for carrying out the change. Magnetic aerials are easier to install as the small cable can be routed through a door or boot opening. The magnets are typically very strong and won’t move until the car exceeds the manufacturers recommended speed – such as 80mph. If the existing aerial is on a relatively flat surface there are a few models available. If the antenna is also used for GPS or is integrated with another feature, such as a rear window washer jet, it won’t be possible to make the change. Some replacement aerials also require a 12V connection. Whilst a complete replacement is the neatest and arguably best performing solution not requiring any trailing cables it is the most difficult and time consuming to install. Suppliers and car audio providers will be able to advise on the most suitable option and price for your vehicle. Once you know whether you can replace the radio, which fascia you need and the best aerial option for your car it’s time to choose a radio and decide on the installation. The most affordable in-dash radios start at around £90. Even though DAB digital radio is the most likely reason for upgrading you’ll often also get a CD player, FM and AM reception, an AUX input socket and USB connection. 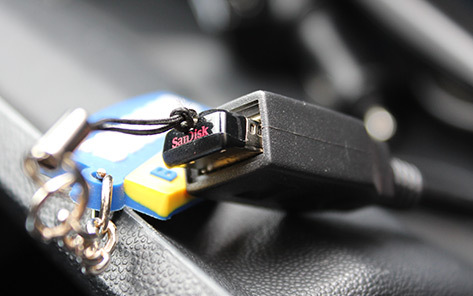 The USB connection works in much the same way as the same feature found on many new cars. You can plug in a USB stick with music or podcasts and play it back through the stereo. Some models specifically support iPods and iPhone control. To add internet radio and streaming services like Spotify to the mix you can also choose a new radio with Bluetooth built in. Bluetooth can be used for making and receiving hands-free calls as well as music playback, but this varies from unit to unit and you should check the specification if these features could be important to you. Many new cars which include these features make efficient use of the display for station and track information. Many single DIN units only have a single line of text on the screen and this can be as little as 8 or 10 characters at a time. 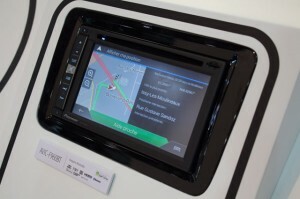 Most double DIN models, although not all, feature a far more graphical display with touch controls. Instead of seeing a single station at a time you might see a list of stations, but without a traditional volume knob and preset buttons it can be more difficult to flick between favourites without looking. Once you’ve selected a model it’s finally time to arrange installation. If you’re confident with vehicle electronics and can find a suitable fascia online you may wish to proceed on your own – and the aerials, adapters and radios do come with installation instructions. If you’re about to buy a used car you could ask the garage or dealer to fit a new radio as part of the purchase during vehicle preparation. 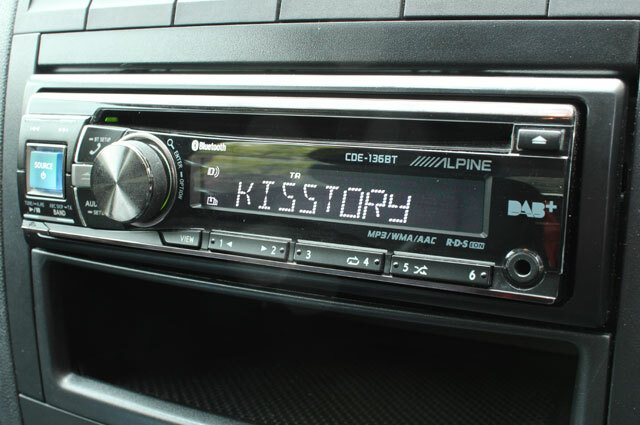 Most shops which sell in-dash car digital radios will offer an installation service or recommend a local installer. If you buy online you should be able to obtain a quote from car audio specialists. Will all the cables be hidden? Will any cables which extend from the radio, such as the microphone for hands-free calls and a USB lead (if no USB port is on the front of the unit), be installed too? Will the aerial be replaced and how? Is the installation work guaranteed? Most installers should offer some sort of guarantee for their work, but likely won’t be able to guarantee the reception of digital radio stations. Whilst replacing a car radio completely is the most invasive and often most costly type of installation it is arguably the most reliable. You shouldn’t be left with any dashboard add-ons, trailing cables or poor reception from small windscreen aerials.